Fernando Alonso moved into a huge championship lead after winning the Monaco Grand Prix for the first time. The Renault driver has a 21-point lead over Michael Schumacher, whose Ferrari finished fifth after starting from the back following a qualifying penalty. 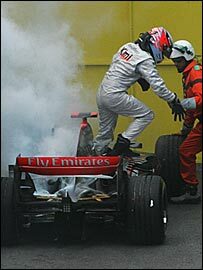 McLaren's Kimi Raikkonen fought Alonso hard until his car caught fire with 28 laps to go during a safety car period. The caution was thrown after Williams driver Webber stopped with engine failure while holding an impressive third. Both Raikkonen and Webber appeared able to challenge Alonso for the lead until their problems. 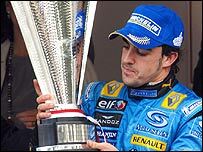 "The race was quite emotional from the start," said Alonso, dedicating the win to Michelin tyres chief Edouard Michelin, who died on Friday. "Kimi (Raikkonen) put some pressure on me, which was quite tough, but it was good in the end. "At Monaco you really have to keep your concentration and push to the limit all the time. It's a race that I put a cross against on my calendar at the start of the year, so now I have it. It's great for team, the Michelin and me. "Every race is becoming more and more important for the championship fight. We are building a gap step by step. "Basically you can't win anything in the races, but you can lose a lot. This time Raikkonen lost a lot." Raikkonen tracked Alonso closely up to their first pit stops, with the Williams never more than a couple of seconds behind. Alonso's lap times dropped off dramatically early in the second stint, allowing Webber and Raikkonen's team-mate Montoya to close right up. But the world champion speeded up as they hit heavy traffic from backmarkers halfway through the race, and only Raikkonen was able to stay with him. Webber, though, was still within six seconds of the leaders - and still looking in contention for victory - when his engine failed as he headed into the first corner, Ste Devote, on lap 48. The Australian pulled over to the side of the track just after the corner with flames licking from the back of the Williams. McLaren blamed a wiring loom that had been burnt because of heat build-up while Raikkonen was going slowly behind the safety car. 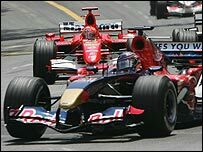 Brazilian Barrichello then lost the final podium position to Jarno Trulli after being given a drive-through penalty for speeding in the pit lane, only for the Italian to retire with five laps to go and promote Coulthard.